The original purpose of this blog was to provide information on the egg freezing process, encourage women during their egg freezing journey and share my own. It has been brought to my attention by my BFF, that I'm not taking full advantage of this blogging business. "Why are you making it so specific? Why don't you include more experiences from your life journey?" The first few words of the documentary tag line clearly say "balancing life" so I guess he has a point. I've been limiting my writing when the truth is: I have complete freedom. I love watching shows on the OWN Network. Lifeclass, Iyanla Fix My Life, The Next Chapter, Super Soul Sunday are one through five on my DVR list. I was watching Lifeclass and as usual paused the show for the 15th time to write some notes. Yes, I take notes. I know I'm a nerd, but there's no turning back now. I realized that when I imagine my life unfolding, I make it manageable. I see it through the eyes of what I think I can accomplish. I hope for fewer occasions that involve embarrassment, pain or failure rather than surrendering to the endless, positive possibilities. For some reason, I concentrate on what I think I can achieve and forget to take advantage of my freedom to dream big. After meditating on this for a few days, I've decided to alter my focus. 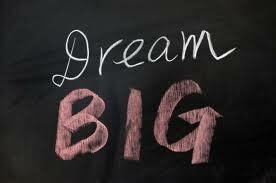 No more concentrating on what I think is possible; I'm directing my energy toward the dream big part of the equation. Although my mind has a hard time wrapping itself around this, dreams are meant to be expansive and expose possibilities. Dreams are meant to be limitless. I can't wait to see how dreaming big manifests in my life. One thing's for sure, however it evolves, I'm pretty sure it's gonna knock my socks off.